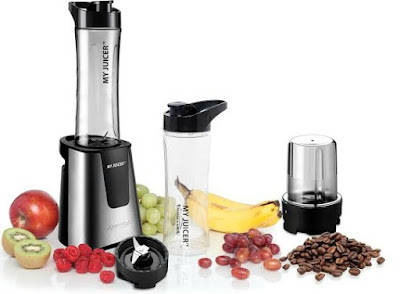 FEATURES OF MY JUICER II - Model BLMJ40136 / SKEW EC107 Powerful Heavy Duty Motor for Crushing Ice, Frozen Veggies & Fruit 300+ WATT (320 Watt Max Power) Motor Base has suction feet for stable operation & Handle for easy storing and taking with you to the office Sport Bottle is Triton(R) shatter Proof Composite Plastic Material, BPA Free for a healthier lifestyle - Fits in most car cup holders Bottle top has compression fit cap for no accidental spills Bottle has measurement Marks on side so you fill it just right Easy to use, convenient size and easy cleanup! 1 Year Limited Warranty Instruction Booklet & Recipe's Included from our Corporate Chef Randy Smith Cleaning: Simply place warm water in bottle up to fill line after use with a few drops of dish soap. Place on motor base and turn on. It will blend & naturally clean itself. If needed use sponge for dried on drinks. Take apart and dry with a clean towel. I have always wanted a juicer and this looks like a great one. Holiday Contest and Sweeps did not receive any compensation in any form for this giveaway. 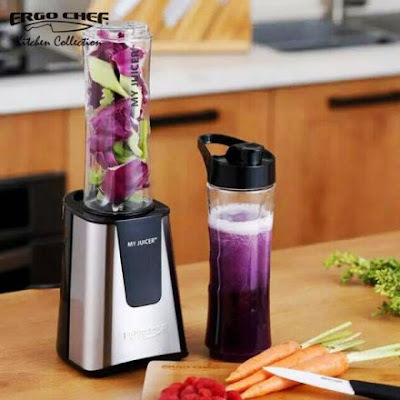 Ergo Chef will be solely responsible for the awarding and shipping of the prize directly to the winner two weeks after the conclusion of the giveaway.